Uncertainty drifts into peoples’ minds when they think about how to keep their money safe. You may think that keeping your money hidden somewhere in your bedroom is the best solution, but keep in mind that piggy banks can be easily broken into. On the other hand, Union Bank promises they can be trusted to keep your money secure. 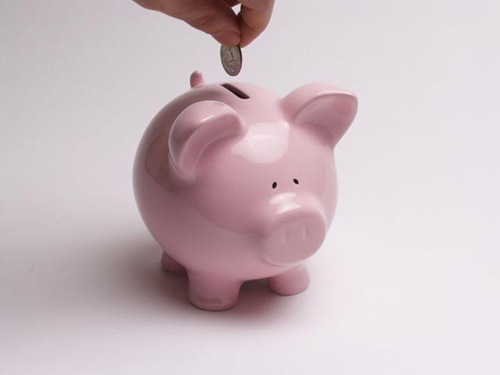 Since I was little, I’ve been taught that saving money, although it is overlooked, is a very valuable skill. Whether it was in a piggy bank or lock box, I always figured out a way to keep my money stored in a safe place. As I got older, though, I knew it was time to start looking for more appropriate and secure ways to keep track of my money. Opening a bank account may not seem like such a big deal to most but it is, in fact, an important step towards sound money management. Personally, I never put much thought into opening a bank account, figuring that things would fall into place. Now that I’m older and starting to make my way into the business world, though, I realize it is a necessary initiative. More and more adults are finding that teaching their kids to save money is an essential lesson to learn. Millions of people have gone through some financial struggles during the recent downturn in our economy. Now with the economy slowly improving they would like to make things better for their kids. My dad taught me a technique that can help weather any economic fluctuation. He told me that when I got my paycheck, I should divide it three ways: 10% to the church, 50% to the bank, and 40% to live on. To this day, I’m grateful to him for teaching me that valuable lesson. Once I opened my first bank account at Union Bank I was able to manage my money and achieve the financial goals I set for myself. For those who have not been taught similar financial lessons, Union Bank offers counseling on the importance of saving your money. If you are not able to put as much as 40% of your earnings into your savings, Union Bank’s new policy can help. With your permission, they authorize a monthly $25 transfer from your checking account to your savings account. Keep all this in mind when you consider opening a bank account at Union Bank or teach your kids the importance of money management. It is never too late to start saving. In the long run, you are only helping yourself. Yes. Union Bank is focused on hiring as many talented individuals in banking and financial services. The bank just added a new facility in Scottsdale, AZ, and hired 600 of the local residents. We are a major employer in the Los Angeles area with a production center in Monterey Park. Locally in Santa Clarita, we are looking to expand here as well. We’ll be adding additional offices to service the communities of Saugus and Castaic and, subsequently, hire new employees. We’re looking forward to adding value to the communities by offering ample employment opportunities. What makes Union Bank stand out is our approach to individual, family, and small business services. While other banks offer traditional products like checking or savings, Union Bank distinguishes itself from the competition by offering programs unique to the market we share. For example, Union Bank has catered to the senior community by creating a financial watch program dedicated to them. It’s not exactly a banking product, but it creates awareness and assists the senior community in protecting themselves from fraud and from being taken advantaged of financially. We have also created for the young people in the community a unique banking program that educates them in how to be smart about banking and managing their finances. Union Bank is a commercial bank, dedicated to offering minority-owned and small business loans; lines of credit to support cashflow, credit card services, and online services such as wire transfer to help speed up cashflow to grow in a global market. With these services, we can help small, medium, and large businesses reach their business goals. We are always on the lookout for promotions that our customers would find attractive. For example, we know that the interest rate market have been low, so we have been offering interest rates that look good on long-term savings such as the FDIC-insured certificate of deposit (CD), which ensures that people will have a good return on their money. Union Bank is also offering the “Company Benefits Program”, where the bank reaches out to the local business owners in the community and offers a $50 incentive to them if their employees open an account with the bank. We also offer a free credit card service, so if a business is looking to expand and reach out to more customers, we offer credit card services online. We offer promotions during certain times of the year so that individuals maximize their return, employees of businesses can receive free banking services, and businesses can increase their customer base to the next level with the credit card services. Because Union Bank is dedicated to serving the community, I think that Santa Clarita has allowed me and Union Bank to really take charge of what our mission statement is: to support the community that we serve and be an active member of the community on a corporate and local level. Being a local resident helps me understand the community I live in not only as a resident but also as a professional in the community, which has helped me understand what role I can play as a company in Santa Clarita to help contribute to the success of our business, organizations, our youth, our senior centers and community, and having the community recognize us as a local, community bank. One of the critical roles in the coming year is to help continue supporting our small business community and support the growth that is needed to help them achieve what they need as an organization. I believe that, coming into the New Year, it would be valuable that we inform, reeducate and retrain those that take active roles years as leaders or business owners in the community. What is the name of your bank? What year did you start working in the banking business? I’ve been with Union Bank for seven years and in the banking industry for 25 years. How did you go about getting started in the business? I started in the banking business because I enjoy being around people and talking to people on a continual basis. When I was an undergrad in college, I had the opportunity to join a bank working part-time, and so the passion of being able to talk to people was something I always enjoyed personally. I wanted people to understand that working in the banking industry allowed me the opportunity to help them with their finances, give suggestions, recommendations, and guide them on what they could do in the future to achieve their financial goals. The main factor of being a banker is to teach people how they can manage and accomplish their financial goals as an individual, family, or a company or organization. So for me, that is my passion and the fulfillment that I’ve received being a banker for so many years. I had written a number of articles concerning financial planning, reducing medical costs, and ways to stretch your dollar. Despite news of economic recovery and an increasing employment index, particularly in the United States, the economy still has a long way to go. We cannot become complacent about the small gains, by no means an indicator that the economy has fully recovered, and we must continue exercising due diligence with our finances during these difficult times. Union Bank of Newhall, CA, has taken great strides towards helping its customers throughout the Santa Clarita Valley. 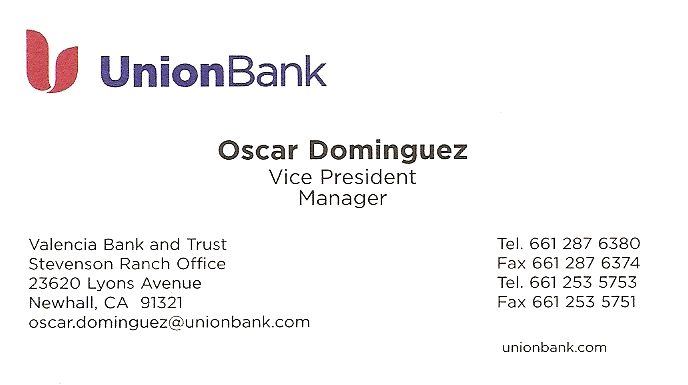 Oscar Dominguez, vice president and manager of Union Bank, has been in the banking industry for 25 years and understands that personal finance is a mystery for many people. He goes out of his way to understand the financial needs of an individual, couple, or family. He also focuses on the growth-oriented needs of business owners and small businesses. Working closely with the community, Oscar and Union Bank not only creates opportunities for customers to make a great return on investment (ROI) by offering FDIC-insured certificates of deposit (CD), but also community outreach programs directed towards children and seniors. 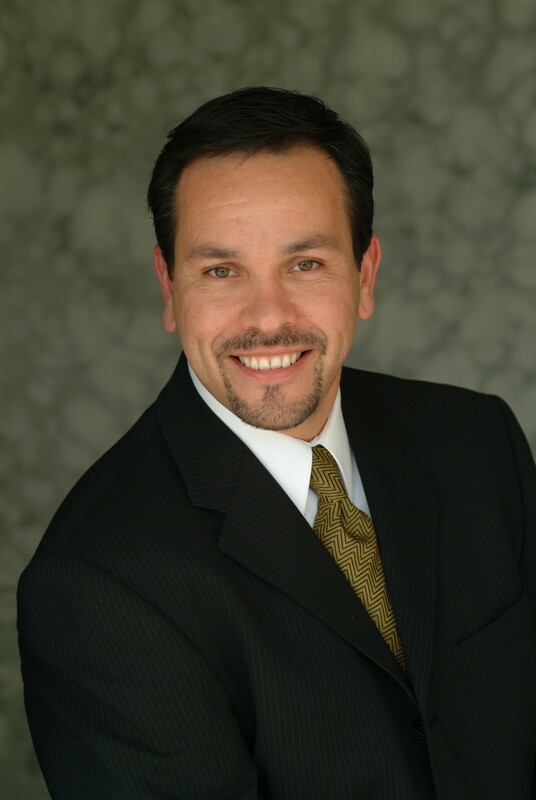 If you, your family, or your business have financial goals you wish to achieve, give Oscar Dominguez a call. All financial goals begin with a plan, and he would be more than happy to work with you towards mapping one out. 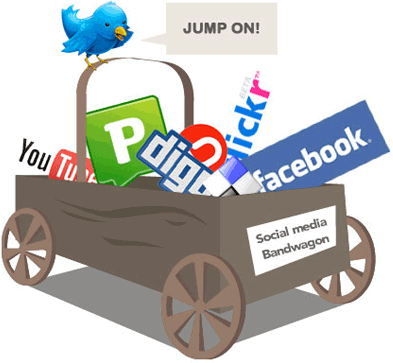 Has your small business taken the plunge and adopted social media for your operations? If not, you’re not alone. Small businesses have slowly adopted social media to some degree or another. Only about 1% of small businesses in the United States and Canada use social media. Why the slow transition? Small business owners’ perspectives about social media differ from the typical consumer who merely uses social media casually. Here are some sobering social media myths that make small business owners think twice about adopting it as part of their daily operations. Photo-sharing websites such as Photobucket and Flickr; video-sharing websites such as YouTube and Revver; content aggregators such as Digg, Delicious, and Technorati; blogging websites such as WordPress and Blogger; and microblogging websites such as Twitter are free to use. However, when business owners factor in the time, skill, expertise, and money involved developing a corporate marketing program that incorporates interactivity, allows user-generated content and, possibly, e-commerce, the price tag of at least $50,000 per quarter makes social media nearly impractical. Most people can upload pictures or videos, submit the URL of their website or blog to a website search engine submission site, write a blog, Tweet, or do any combination of these things. However, experienced social media marketers would have the savvy to incorporate interactivity throughout all of this into an effective online marketing campaign. Read about the rest of the social media myths. Rick Montoya, president of Valencia Welding, Inc., has worked at Santa Clarita Valley’s Industrial Park for almost 30 years and has done welding with a variety of metals during that time span, from steel, stainless steel, aluminum, and even titanium alloys in aerospace applications. Unbeknown to me, a non-welding techie, it turns out that there are many, many ways to stick two pieces of metal together. I won’t give you the earful that Rick gave me, but a small primer about what holds your copper pipes together as well as the titanium tubes in the B-2 Bomber, is forthcoming. Welding has come a long way in a very short time span. Even as recently as the end of the 1800s, welding consisted of one process alone: forge welding, the process in which blacksmiths joined metals together by heating and hammering them. However, by the start of World War I, a demand for reliable and inexpensive joining methods brought forth new arc welding and related processes. 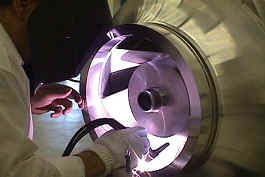 The Space Age in the 1950s demanded precision, giving birth to laser beam and electron beam welding. By the turn of the 21st century, the industry had a wide array of welding processes at their disposal. I alluded to a specific type of welding, but generally speaking, what is welding? It is a fabrication process that joins materials, such as metals or thermoplastics, by causing coalescence and is usually done by melting the parts with a filler material, forming a pool of molten material that, when cool, becomes a strong joint, depending on the metals used. On the other hand, the titanium welds that Rick has performed were done in a Spacetron Vacuum Chamber at Spacetron Metal Bellows, a provider of complex, titanium bellows and precision-welded titanium structures for the aerospace industry, where Rick is Chief Operating Officer (COO). If I didn’t drink so much coffee, I’d have the steady welder’s hand that he has. Disclosure: Valencia Welding, Inc. is a client. Twitter has much promise in promoting small and medium businesses (SMB), which can use as much promoting and marketing across a widespread social media network as possible. How, then, should SMB’s produce compact, yet effective, messages, or Tweets, to promote themselves? The Tweet, above, is one of a variety of Tweets that I use to promote my client, Valencia Welding, Inc. in Santa Clarita, California. To the untrained eye, the Tweet is intimidating, but if you befriend, or “follow”, other Twitter users that are very well-versed and knowledgeable in the use of Twitter (I recommend @TweetSmarter or @anthonystevens4), you will learn a lot about the medium. Below, I break down each part of the Tweet and why it is important. “Client’s business name as a hashtag.” A hashtag is a word or phrase, preceded by a pound (#) sign, that allows it to be seen in Twitter’s public timeline. Furthermore, hashtags effectively index the word or phrase and allow it to be searched easily. Note that #ValenciaWelding is contained within a single hashtag with no spaces. If I attempted to create a hashtag in the following manner (#Valencia Welding, with a space in between), the hashtag would apply to “Valencia” but not “Welding”. “City where business is located.” This is self-explanatory. I used up to five hashtags for the location of the client’s business because Valencia Welding is located in the community of Valencia, within the city limits of Santa Clarita Valley, CA. Locally, the city is referred to as “SCV”. “Promoting the client as a Small and Medium Business.” This is also self-explanatory. “Link to a blog with more information about the client.” The number of characters allowed for Tweets is limited to 140 characters, making Twitter a great medium for generating buzz. Like reading a newspaper, Tweets serve as attention-grabbing headlines, and a blog is the best place to give more information about the client. “Twitter username of the social media company promoting the client.” My company’s username, @FlowerBlossoms, serves as a signature at the end of the Tweet. Lastly, notice that I circled the number “33” at the upper right corner of the text box. That is the remaining number of characters allowed for the Tweet out of 140 characters. It is important that your Tweets are no more than 120 characters in length so that other people can forward, or “Re-Tweet”, your message to their followers. If you have any comments, questions, or suggestions, please drop me a line. Yes, I would like to start hiring once students graduate from the welding program at COC. They will join the Valencia Welding team to do welding and fabricating services and make repairs on site at local restaurants. Also, we were invited to participate in the second annual business expo/job fair, which will be held at the OLPH campus in Santa Clarita. Going the extra mile for our customers. On one occasion, I was clear across the Santa Clarita Valley when one of our customers called and needed a weld repair on a critical stainless steel mold. Without this weld repair, they would not be able to proceed with the production of their products. Plus, the customer was at their facilities waiting to see the production of their product get back online. So I got a call at 7:00AM in the morning and had to go across town and be at my customer’s facility within the hour to perform the weld repair. I arrived within the hour, completed the weld repair, and my customer and their customer were very happy with the results and the production went back on track. What niche are you serving with your business? The niche of Valencia Welding is a quick turnaround to work closely with our customers to get their product completed. We offer welding and fabricating services. I love working in the Santa Clarita Valley. The people and businesses are great. We are like a big family. I am looking forward to expanding the business into the Antelope and San Fernando Valleys as well as working together with the Welding Department at the College of the Canyons (COC) to train welders for this type of welding.